"Who scratches the birch tree and licks oozing sap? after months without food. " Moon bears, or Asiatic black bears, are becoming increasingly rare in the wild. They have distinctive blazes on their chests that resemble the crescent moon. The bears are seldom seen but leave footprints, claw marks, hair, and bear nests high in the trees. These traces provide clues about their lives in the mountains and valleys of Southeast Asia. Moon bears hibernate for up to five months of the year, and litters range from one to four cubs. 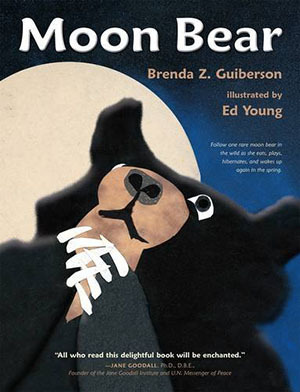 Follow one moon bear in the wild as she eats, plays, hibernates, and wakes up again in the spring. Activities are available for this book!